You know what makes things more difficult? Adding on extra things to it or making it more expensive to do it. Mount Lanakila effectively makes it difficult for Basic Pokemon to retreat by upping their Retreat Costs by 1. While this card would’ve probably been somewhat effective in the EX era, where Basic Pokemon were frequent enough and bulky enough to warrant play from things like Skyarrow Bridge – a Stadium that essentially does the same thing as Lanakila but makes it cheaper instead of more expensive – nowadays we’re shifting into a meta based around Evolutions. That means this card will realistically only affect those Basic Pokemon that evolve into Evolutions and the Basic-GX that exist, though there are plenty of those around and about. But to make things worse for Lanakila, it’s been printed in a time where switching manually is rarely done. That’s mainly in part thanks to cards like Acerola and, more notably, Guzma. That makes the retreat cost almost a null factor in most situations, so having a card like this around, while useful in niche situations, isn’t that great overall. Arora Notealus: Mount Lanakila is a super cool idea, but it’s a little confusing to me. It’s like they took Mt. Fuji and stuck it in Hawaii just to say that Pokemon can have snow? And also justify Alolan Ninetales and Sandslash perhaps? It’s a weird spot to say the least. Still it’s definitely tall enough to make it work. Another day, another Stadium we skipped over when it was new: this Wednesday we are looking at Mount Lanakila (SM – Burning Shadows 118/147). This Stadium increases the Retreat Cost of both player’s Basic Pokémon by [C]. Evolutions are not affected, even if they have been put into play directly. This is the second card this week we might have fudged into our Throwback Thursday slot: the wording is a bit different, but the stats and effect are that Broken Ground Gym (Neo Destiny 92/105). It does specify Baby Pokémon and Basic Pokémon, but no Baby Pokémon has ever released that was not also a Basic Pokémon: this an example of the needlessly redundant reminder text that plagued so many early cards (Neo Destiny officially released back in February of 2002). Back then, this effect was at least a little useful; all of those “Baby” Pokémon I mentioned had free Retreat Costs and the protection of the “Baby Rule” (rules text on the card that forces you to flip before attacking it; your turn ends if you fail); some had very competitive effects as well. Some were great openers, all were at least adequate as stallers, and all were perfectly functional pivot Pokémon. Having a Pokémon you could easily repeat was very important during the 2001-2002 Standard Format (a.k.a. the original “Modified” Format); Gust of Wind and Switch (yes, Switch) were gone from the cardpool, replaced by Double Gust (Guzma as an Item but your opponent picks which of your Benched Pokémon is promoted) and Warp Point (Escape Rope by another name). Most decks were relying on Evolutions as their main attackers as well; Basics were in supporting roles. Fast-forward to today; Guzma and various other effects give value to pivot Pokémon, which makes Mount Lanakila a little tempting. However, there are some key differences that make Mount Lanakila a poor deal. While there are decks that need to manually retreat frequently, many (most?) of those also include an effect to zero out Retreat Costs (as opposed to having a natural free Retreater) or some other workaround. A card like Float Stone that zeroes out a Pokémon’s Retreat Cost overrides the increase from Mount Lanakila. This is actually a mixed blessing; such effects can be used to spare your own Pokémon from its effects, as can simple, strategic play. In the end, however, I think the biggest problem is that you can just use the space in your deck for better cards, Stadium or otherwise. That makes this (at best) a niche card in Standard and Expanded; I think there are more (key) Basics for Mount Lanakila to trip up in Expanded, but also more answers to it, so I’m scoring them the same. Enjoy it in the Limited Format; you’ll have to mind the effect yourself, but its main purpose is taking out Po Town… possibly your own and not just your opponent’s! As a final note, this card might be one to remember in the future, namely after we lose the last of the XY-era cards as they seem to be the ones that blunt its effects the most. Mount Lanakila is another card that does more harm than your opponent. This stadium taxes each Basic Pokémon’s retreat cost by one, making you discard one more energy to pay for your retreat cost. In decks with only Basic Pokémon, that hurts a lot. Unfortuantely, this Stadium gets played around a lot, being discarded with another stadium or Field Blower, using Dark Cloak/Aqua Tube/Gyro Unit abilities or Float Stone to CANCEL all retreat cost, or employing switching tactics like Stand In Zoroark or Ultra Road Solgaleo-GX. I get that some Pokémon have attacks that do more damage based on your opponent’s Pokémon retreat cost, but I haven’t seen such a deck outside of Celesteela-GX’s Rocket Fall. Mount Lanakila… is actually a very cool Stadium that does something very unique for the meta full of decent decks that fulfills its criteria that it can actually pull its weight in some decks. This Stadium reads that every Basic Pokemon’s Retreat Cost in play gets an extra [C] in their Retreat Cost. An extra [C] might seem small, but in truth it can turn some turns where your opponent can actually do something into a “Damn, I’ll just pass as I can do nothing” turn. Think of the popular Big Basic decks in the format currently: Buzzwole-GX can’t retreat unless they have 3 energy which they might want to save their Strong Energy (a big boon to them), Lapras-GX can’t retreat unless they have 3 energy, Tapu Bulu-GX needs 4 energies to retreat and Volcanion-EX decks which needs the same amount of energy to do so. All of those decks I mentioned are decks which really loved their energy counts, and having to pay an extra energy to retreat can actually hinder them a lot, both in Pokemon preservation and in their board state. A cool combo I’ve used is to use the Alolan Dugtrio (SM Base) with the Tangling Hair ability to give another extra [C] to their Active Pokemon’s retreat cost for every Duggy I have in play, making it so that evolving won’t let them escape the grip of Mount Lanakila. Even evolution decks which they think are in the clear doesn’t escape the wrath of this Stadium; evolving basics which need 3 energies to retreat like Beldum are going to suffer. Sure, this card can be countered easily by decks which play Pokemon that can give free Retreat (Manaphy-EX, Darkrai-EX DEX, and Silvally-GX), Float Stone and switch cards, but to do so they expend more resources and lure themselves to decking out more. It does have an inherent weakness to Ultra Road, which is understandable but again if a card has no counters, then it would be too powerful and will get an errata like Pokemon Catcher. It is a Stadium so it can be bumped away, and it’s passive in that effect as well unlike the Alolan Dugtrios I mentioned earlier. But, there are those times where your opponent whiffed the Stadium or Field Blower to bump it away, and in those situations, you will win the board state war very easily. It’s not the most game breaking card ever (it’s far from it) but when played well, it can turn the tides to your favor. Mount Mele Kalikimaka (Burning Shadows 118) rose into the meta from the Burning Shadows expansion set. 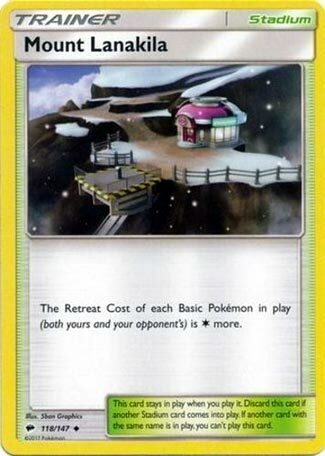 This stadium card increases the retreat cost of each Basic Pokemon in play by one Colorless energy. Again, another underpowered card that the designers had to know wasn’t going to see any use when they finalized it. About the only card I could think of to pair it with was the Wobbuffet also out of Burning Shadows. But then I realized that Float Stone incapacitates that Wobb, and aside from that I absolutely can think of no reason to ever play this card. Seriously, what were they worried about? Oh we can’t increase the retreat cost of every Pokemon. It’s not like we have Guzma coming out in this set. Again, why not every Pokemon? It still probably wouldn’t see play. Maybe if it said “Basic Pokemon cannot retreat” or even more interesting “No Pokemon can retreat” WOW now those are interesting cards! Those are cards I might think about playing. This? I guess a shiny one might make a good bookmark. At least its name reminds me of the light hearted Christmas song by Bing Crosby and the Andrews sisters.